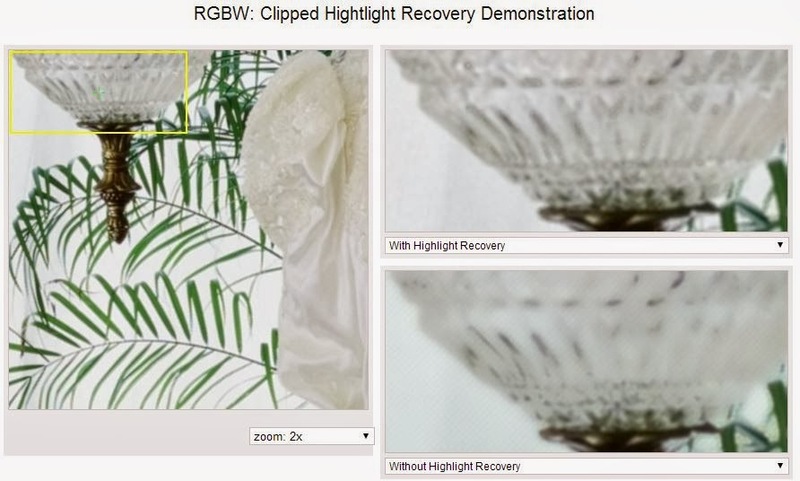 Seattle, WA-based Image Algorithmics comes with a way to extend DR of RGB-W sensors by eliminating the over-exposed W pixels in its demosaicing solution: "Our processing trades off overexposure performance with artifacting and can tolerate 6dB of overexposure on typical images with little artifacting. This corresponds to a 3dB increase in the dynamic range of the system and enables the RGBW CFA to equal the noise performance of a Bayer sensor with twice the pixel area." We have used the same demosaicker for both the "with" and the "without" versions. You can verify identical performance in image areas that are not overexposed. A pattern is indeed visible in the overexposed areas of the "without" version. Most demosaickers "without" HDR will likely smooth out exposed areas, and we haven't done that. While smoothing will remove the pattern, it will not recover lost highlights. If anything, it will further kill the highlight detail. Thanks for explaining. You are assuming same exposure time on W pixels. As far as I know that's not true. At least not on OV sensors.